Here’s a repost from last year I thought was appropriate since the Miami Heat won the NBA Championship last night. I’m not really a fan of pro basketball, but I must say that the free-agent talent raid pulled off by the Miami Heat has made for interesting conversations since last summer. From marketing hype at it’s most annoying (LeBron James’ announcement –“The Decision” – that he was going to the Heat) to instant pundits proclaiming them the next dynasty to a chorus of “I told you so”, it’s been more like a three-ring circus than a basketball team. The Ego Equation: start with sacrifice. High-priced talent doesn’t ensure success. Think New York Yankees – or the Knicks. Sports not your thing? Remember when Steven Spielberg, Jeffrey Katzenberg, and David Geffen looked like a can’t-miss team at DreamWorks? Turns out, no one bothered to account for the polarity of their personalities. Teaming up has its trade-offs. Where once Wade had the spotlight, now he has to share it. No more entourage traveling with James. All three have seen less of the basketball. In other words, the team’s leaders have done what stars need to do when they merge: show a willingness to sacrifice. It’s a necessary start. The Platoon Principle: adversity is an asset. Nothing brings a team together like a common enemy. Google needs Facebook. Under Armour needs Nike. 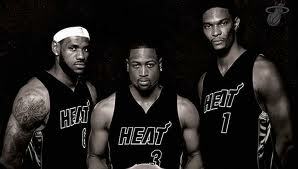 The Heat need everybody who’s not the Heat. Coach Erik Spoelstra hoped to turn the vitriol to his advantage. The real bonding didn’t occur until the team began to lose – and badly. Said Spoelstra: “When it’s raw, when you don’t get along, that’s when there’s the most opportunity for growth.” Under duress, Miami found its identity. The Trust Theorem: when the going gets tough, turn to one another. Watching the three superstars at practice, it’s obvious these guys get along. But camaraderie doesn’t necessarily translate into collaboration. When you assemble a team of experts, it’s better to have complementary, not competing, specialties. The Credibility Conundrum: manage from the inside out. Coach Spoelstra’s position is like any manager operating between the CEO and the in-the-trenches talent. Spoelstra needs to tread carefully, balancing his obligations to his boss and his commitments to his players, all in his quest to build his own credibility for leadership. The coach must wrestle when to coddle and when to push, trying to master the sleight of hand that allows the young millionaires to feel they have ownership of the team even as he calls the shots. The Law of Patience: beware the blame game. Everyone remembers the six NBA titles the Chicago Bulls won with Jordan, Pippen, and a cast of specialists to support them. What we tend to forget is how long it took the Bulls to put all those pieces together. They didn’t win the first year. Or the second. Or even the third. It took the team four years. Chemistry takes time. The playersrespect one another’s individual skills and even learn from one another. But those patterns don’t emerge right away. Chemistry isn’t something you create and then ignore. It’s a reflection of the bonds between members, and those bonds are fragile and needy – and constantly changing. This is what any team aspires to: passion, unity, and absolute conviction that you can achieve whatever you want as a group. What teamwork lessons can you learn from the Heat and apply to your team? This entry was posted in Teamwork and tagged Miami Heat, teamwork. Bookmark the permalink.